GetInterviews.com's consultants are highly accomplished professionals with years of experience in effective resume/cover letter preparation and career marketing strategies. 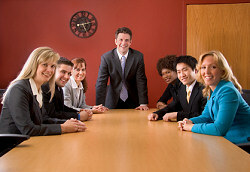 The firm is Licensed by the State of New Jersey and all staff members are Certified Professional Resume Writers (CPRW). All our writers are Certified Professional Resume Writers (CPRWs) and average 10 years writing experience. In business since 1994, we have written more than 100,000 resumes to date. Collectively, our writers have appeared on television and radio, are published in numerous career books, held Board positions at resume/career industry associations, had hundreds of resume and career articles published, been quoted as a resume/career expert in major magazines and newspapers, spoken at conferences, and served as bloggers for career sites. Our writers have written resumes for job seekers from Monster, CareerBuilder, Dice, and have aided members of more than 50 organizations including American Society for Quality, American Society of Association Executives, American Society for Training and Development, Project Management Institute, Association of Strategic Alliance Professionals, American Public Health Association, American Society for Industrial Security, American Society of Civil Engineers, Urban Land Institute, American Forest & Paper Association, Real Estate Best Jobs, YourOnRamp, The Wall Street Journal, and more. Unlike many other resume companies and career sites, we don’t just accept a resume writer because they have experience or credentials. In fact, for every ONE writer we accept, we turn down TWENTY applications. Every writer that we accept must also go through our own rigorous in-house training and examination process regardless of how much experience or credentials they may have. This ensures our clients will receive our Standard of Excellence promise. With other resume services and career sites that simply accept resume writers and let them write in whatever style they wish, you may get a good writer or you may end up with one we have rejected. Your resume will be written based on the whim of the writer and they may be out of touch with today’s market. If THEY like a certain font, that’s the font you get. Not the font the hiring managers prefer. You can see that it can be hit or miss. At GetInterviews, we continually seek out feedback of recruiters and hiring authorities on what they want to see in a resume – content, format, font style, and even type set size! Unlike other services, we do not leave it to the whim of the writer who may have been taught five years ago how to write resumes, and has never adapted to the changes needed for TODAY’S resumes. Every resume written by our team of resume experts adheres to the Quality of Excellence that has proven effective in landing interviews – even in today’s tough economic markets. We even guarantee it! As one of the first resume firms to guarantee interviews, for more than 15 years we have stayed true to that promise to clients – even in today’s sea of lay offs and high unemployment rate. Our writers are experienced experts in writing for a global market. We write resumes and CVs for job seekers in the USA, Canada, UK, Europe, Central and South America, Asia and more. That sort of international knowledge gives all our clients the edge as more and more companies do business on an international basis. Alesia Benedict, CPRW, JCTC, is a high-profile industry leader with extensive experience. She is a frequent keynote speaker for professional associations and corporations regarding resume writing, job search planning, and career marketing. She lectures to college audiences and serves as a public speaker to community organizations and government agencies. Her prior experience includes serving as the National Director for an executive search firm.